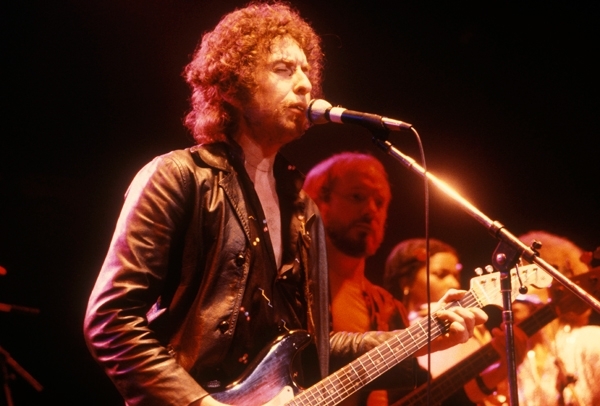 1979 was not a big year for Dylan as a live performer, relatively speaking. After the enormous world tour of the previous year, he performed “The First Gospel Tour” (of three). This began with an epic fourteen day residency at the Fox Warfield Theatre in San Francisco from the 1st to the 16th of November. From there he performed four shows in Santa Monica for World Vision International, and then a further eight shows on the road in California, New Mexico and Arizona. All of the Dylan shows during this period were pretty close to the same thing: He generally performed the same seventeen gospel songs in the same order every night, with only the slightest possible variation. He never played a single song from any of his previous albums, which must have been tough for people who didn’t know that going into the show. I’m sure that there are people out there who have listened to every single bootleg and who can point to very fine distinctions between the shows, but that’s not going to be me. There is an old AngelFire website dedicated to this tour here – it has transcriptions of a lot of his stage patter, including his description of having the cross thrown on stage in San Diego the year before. What I listened to this week was the contrast between two shows. I listened repeatedly to one of the Santa Monica shows. This has an appreciative audience – he is playing for a religious crowd who know that they have come to see a gospel show. Generally, the band is tight, Dylan is in good form, the venue is intimate enough to provide good sound. It’s a really good show – if you’re into the music from Slow Train Coming and Saved, which all in all I’m really not. It’s a genuinely strong performance of music that I’m not interested in much at all. Dylan: “Well. What a rude bunch tonight, huh? You all know how to be real rude. You know about the spirit of the anti-Christ? Does anybody here know about that? Well, it’s clear the anti-Christ is loose right now, let me give you an example. You know, I got a place out, ah, somebody stopped by my house and gave me this, uh, tape cassette. Some of these kind of people, you know, there’s many false deceivers running around these days. There’s only one gospel. The Bible says anybody who preaches anything other than that one gospel, let him be accursed. [“Rock-n-roll!”] Anyway, you know, this fellow stopped by my house one time and wanted to, so called, “turn me on” to a . . . well I’m not gonna mention his name, he’s a certain guru. I don’t want to mention his name right now, but ah, he, he has a place out there, near LA [“Malibu!”] And ah, he stopped by and he gave me this taped cassette to show me … [“Rock-n-roll!”] … You wanna rock-n-roll you can go down and rock-n-roll. You can go see Kiss and you rock-n-roll all your way down to the pit. Anyway, let me give you an example here. I’m gonna give you a real good example, I took a look, I dropped this tape cassette off with a friend of mine. [lots of heckling and others trying to shout the hecklers down] Turn the lights on in here. I want to see these people. Turn some lights on. Give them some light. Let them in the light. [applause] So anyway, this certain guru, you wanna hear about this guru? So anyhow, [“Rock-n-roll!” “Shut up!”] All right, so this guru, he made a film of himself. He had one of these big conventions. He does have a convention I think every so often like once a month, he’ll go to a big city. [“Praise the lord with puke!” “Shut that guy up!” Applause] Now, so, I took a look at this tape, and sure enough he was having himself a big convention. He had, must have had five thousand to ten thousand people there. Eight thousand people. And what he was doing on the stage was, he was sitting on there with a lot of flowers and things. And he sure did look pretty though. He’d sit up there, you know like kind of like on a throne and you’d listen to him talk on the tape. And on the tape, he said, you know, what’s life all about is life is to have fun. He said, “I’m gonna show you now how you all can have fun.” And he had a big fire extinguisher there and he put colored water in this fire extinguisher, and he would spray it out on the people. And they all laughed and just had a good time. They took their clothes off. They were overjoyed to be sprayed by this man. [Booooo!] And a little while after that, he started talking about his philosophy. And he said that he was God — he did say that. He said that God’s inside of him and he is God. And, you know, that those people could just think of themselves as God. I want to tell you this because there’s many of these people walking around. They might not come right out and say they’re God, but they’re just waiting for the opportunity too. And there is only one God. And let me hear you say who that God is? [mixed shouts] Their God, he makes promises that he doesn’t keep. There’s only two kinds of people like the preacher says — only two kinds of people. Color don’t separate them, neither does their clothes … [Rock-n-roll!] … You still want to rock-n-roll? I’ll tell you what the two kinds of people are. Don’t matter how much money you got, there’s only two kinds of people: There are saved people and there’s lost people. [applause] Yeah. Now remember that I told you that. You may never see me again. I may not be through here again, you may not see me, sometime down the line you’ll remember you heard it here. That Jesus is Lord. And every knee shall bow to him. How many people here are aware that we’re living in the end of times right now? How many people are aware of that? Anybody wanna know that? Anybody interested in knowing that we’re living in the end times? How many people do know that? Just, yell out or do something. How many people don’t know that. Well, we are, we’re living in the end times. [“The times they are-a changin!”] That’s right. I told you that. I told you “TheTimes They Are A-Changin” twenty years ago. And I don’t believe I’ve ever lied to you. I don’t think I said anything that’s been a lie. I never told you to vote for nobody. Never told you to follow nobody. Well, I’ll tell you a story about that now. When Jesus saw this woman, they all wanted to stone her. Because, you know, she was an adulteress. So they come by and they wanted to stone her. And they said to Jesus, they said, “Master” they said, they wanted to trick him, you know, so they said, “What say you? What do you say there, should we stone this woman? Because she has been an adulterer?” And he says, “Well, let him who is without sin cast the first stone.” They all just dropped their stones and they walked away. And then he said to the woman, he said “Woman,” he said, “You’re free now. You go and sin no more.” And the woman left. Well, let me tell you, that the devil owns this world. He’s called the God of this world. Now we’re living in America. I like America just as much as everybody else does. I love America, I gotta say that. But America will be judged. You know, God comes against a country in three ways. First way he comes against them, he come against them in their economy. Did you know that? He messes with their economy the first time. You can check it all the way back to Babylon, and Persia and Egypt. Many of you here are college students aren’t you? Many of you are college students. You ask your teachers about this now. You see, I …uh .. I know they’re gonna verify what I say. Every time God comes against a nation, first of all he comes against their economy. If that doesn’t work, he comes against their ecology. It ain’t nothing new that’s happening. He did it with Egypt. He did it with Persia. He did it with Babylon. He did it with the whole Middle East. It’s desert now. It used to be flourishing gardens. All right. If that don’t work, if that don’t work, he just brings up another nation against them. So one of those three things has got to work. Now. Jesus Christ is that solid rock. He’s supposed to come two times. He came once already. See, that’s the thing, he’s been here already. Now, he’s coming back again. You gotta be prepared for this. Because, no matter what you read in the newspapers, that’s all deceit. The real truth is that he’s coming back already. And you just watch your newspapers. You’re gonna see, maybe two years, maybe three years, five years from now, you just watch and see. Russia will come down and attack in the Middle East. China’s got an army of two hundred million people. They’re gonna come down in the Middle East. There’s gonna be a war called the “Battle of Armageddon” which is like some war you never even dreamed about. And Christ will set up his kingdom. He will set up his kingdom and he’ll rule it from Jerusalem. I know, as far out as that might seem, this is what the Bible says. [“Everybody must get stoned!”] I’ll tell you about getting stoned. What do you want to know about getting stoned? [Mixed shouts] Alright, what you’re gonna need is something strong to hang on to. You got drugs to hang on to now. You might have a job to hang on to now. You might have your college education to hang on to now. But you’re gonna need something very solid to hang on to when these days come. Let me tell you one more thing. When Jesus spoke his parables, he spoke them to people, he said, he said parables to all these people. Everybody could hear the parables. Everybody heard the same parables. Some people understood them and some people didn’t. But he said the same one, he said the same thing to everybody. You understand, he didn’t try to hide them, he just said it. Those that believed it, believed it and understood it, and those that didn’t, didn’t. That’s right. We’re gonna play a song now called “Hanging On to a Solid Rock, Made Before the Foundation of the World.” Now remember now, you talk to your teachers about what I said. I’m sure you’re paying a lot of good money for your education now, so you better get one. 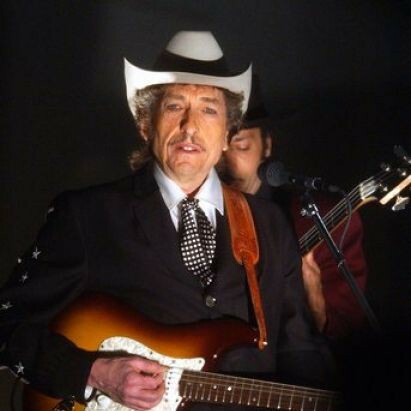 Unlike the KMEX interview, here we get some genuine sense of what it is that Dylan actually believes, straight from his own mouth, and we get considerable pushback from some angry fans who want to hear his older songs. Sorry, pal, you can call out all the titles you want, but Dylan doesn’t play that anymore. Ugh. I am a bad audience for this sort of thing, having been terrorized by “end times” prophesying in church as a teen, something I came to deeply resent when I realized it was all fear-mongering nonsense. Sad to see that Dylan imbibed and spat back this sort of Christianity: militant prophetic premillenarianism. Again, ugh. So much less appealing than the actual music, which, on occasion, still soars.